In the earlier technology, OMR sheets needed to be printed in two colors using the color-dropping feature. In fact, in some of the existing software, which are based on this old technology, this requirement is still there. But, for the new technology like the sheet software by Addmen, two-colored OMR printing is not essential. You can also print black and white sheets. But, there are still some companies and organizations, which insist on using colored sheets. But, with Addmen software, users need not be restricted to printing only color-dropped sheets. InkJet or Colored laser printer can be used for printing the OMR sheets in color. To bring down the cost, one can also print colored sheets through offset printing. 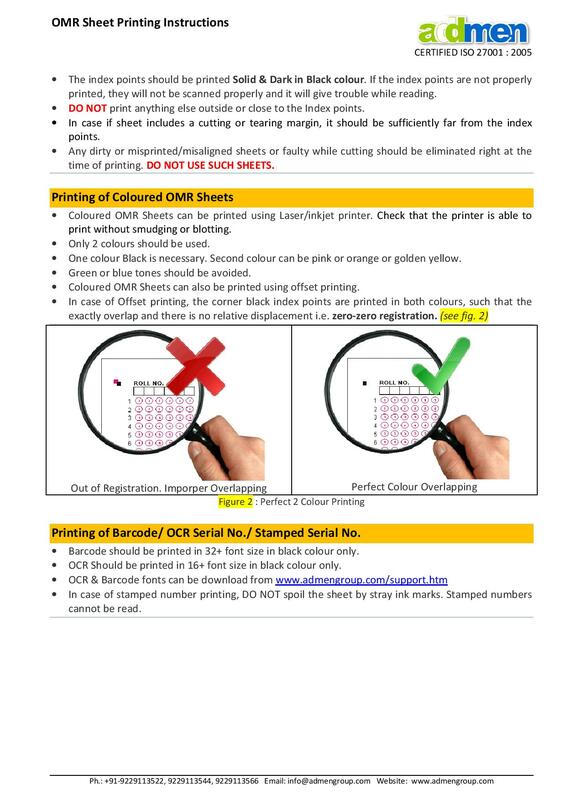 For taking out colored printouts, the OMR portion should only be printed in two colors. All the other designs can be printed in any other color. Black is the main and important color and it has to be there. The other color can be anything like Pink, Light-Green, Water-Blue, or yellow family. These colors get dropped during scanning. Sheets with checkboxes instead of OMR bubbles should be printed in two colors. And, if you are going to use the Offset printing, the index points in the corners should be printed in black and any other color. But, it should be noted that there should be no overlapping.